Hacker Evolution from exosyphen studios, the creator of hacker games series such as Digital Hazard, BS Hacker and etc, is a hacking simulation game. 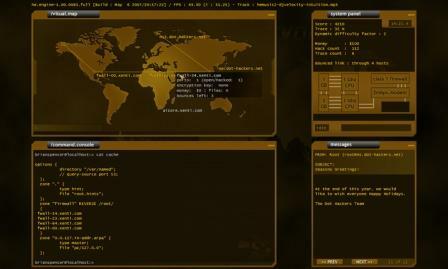 In the Hack Evolution game, player plays role of a former intelligence agent, Brian Spencer, who specializes in computer security, against a complex enemy created by an artificial intelligence (AI). In the game, player assume the role of a computer hacker, and has to look for exploits, steal money to buy hardware upgrades, solve puzzles, examine code and bits of information to achieve objectives, such as find out what happens and attempt to stop the event when a chain of events sets off worldwide, leaving critical service disabled, when a stock market, a central bank, satellite uplink and transoceanic fiber optics links crash. The concept behind Hacker Evolution is to create a game that challenges the gamer’s intelligence, attention and focus, creating a captivating mind game. Hacker Evolution now also include Hacker Evolution: Reinsertion expansion pack for free, which previously has to be purchased. Hacker Evolution game costs $19.95, but for today only (December 28, 2009), giveawayoftheday.com is giving away the free license with genuine working activation key code to register Hacker Evolution full version game.